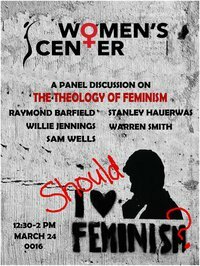 “Should I Love Feminism?” asked the clever advertisement for a panel on the utility of feminist theology at Duke Divinity School. A Facebook event page soon became littered with RSVP’s in the hundreds, the interest no doubt expounded by an all-star line-up of scholars. It was an intentional strategy on the part of the sponsoring Women’s Center to invite only men to speak on this topic. Without the perspective of these powerhouses, the panel could have easily been dismissed as the worn-out, worn-thin, haggardly arguments of disenfranchised women. Such is the mythical reputation garnered by second wave feminists. The event would have been relegated to the trash heap of “women’s issues,” a sub-field of academia becoming less popular with every click of the remote to watch the Bachelor or Real Housewives . The media has declared feminism dead more than once in the last three decades. Opening remarks framed the debate, if such a tempered discussion could be called as much, and offered praise for the male supporters of the women’s center. Applause is rightly given to those who make genuine moves toward reconciling gender disparity. Applause, however, is not incentive enough for leaders to charge brazenly into the future of feminist reformation. Something more intrinsic than one’s affection for mothers, wives, and daughters must be named. Without a clear stake in one’s sense of self or one’s sense of the divine, leaders who are merely “in support” of women and “their issues” risk becoming the paternalistic figures of benevolence feminists have long critiqued. Someone has told these men of a different generation than I that the goal of feminism is women’s equality. At the debate’s outset, Associate Professor of Historical Theology Warren Smith defined the contested movement of feminism, first organized at the end of the 19th century and heightened during the civil rights era of the 1960’s and 70’s. While he wisely asserted feminist’s multi-vocal platform, Smith articulated its most basic concern as recognizing the full humanity of women. This is indeed true. This is not the whole truth. The whole truth is that the feminism is about recognizing the humanity of all gendered persons, women among them. The cultural context of the last twenty years has shifted western feminism’s focus to a more nuanced, complex, and diverse approach to gender transformation. As with the “post-ing” of modernism, the post-feminist corpus has complicated the perceived solidarity of its predecessor. While this makes it harder to organize for social change, it does expand the subject for whom feminism is concerned to the overwhelming breadth of men, women, and those who eschew binary categorizations. To me, it felt as if the panel discussion could have taken place twenty years ago. My illusion of academia being on the cutting edge of discourse has slowly evaporated from sight as I finish out my first year in graduate school. Instead, I sat through a ninety-minute discussion on the arguably uncontestable idea that women should be honored in the classroom, in the workplace, and in the home. I wish there had been a larger critique of the way that men’s bodies have been regulated in the rhetoric of masculinity, how their socialization has inhibited their expression of vulnerability, how their full humanity has been distorted by the power regimes of which they are expected to be a part. I wanted to stand up, point my finger, and say, “You. This affects you, too.” Especially in much of the western world where women have gained the basic rights of citizenship, it is critical for leaders to recognize that in many ways it is now men who are failing to live up to their full humanity. Look at our soldiers, our prisoners, our politicians. What is the cost of their masculinity? A Christian feminist approach ultimately reflects the heart of Jesus. It is undoubtedly a heart that gives special attention or “support” to society’s marginalized; undoubtedly, these are often women. But these are not only women. Feminism then is not an additive to the Christian narrative as was implied by Smith. Christianity is inherently feminist in so much as it unequivocally affirms the humanity of both men and women in the image of God. As Christian leaders, our stake in feminism must be named as nothing less than the Cross, nothing less than abundant life. I hear that so loud and clear. That was a big part of my experience in grad school. The people thinking the furthest ahead into the current moment and the future were sitting and listening, not leading from up front. Thanks for putting the call and challenge of full humanity out there for all of us and all our gendered relationships! I can see you doing that. I’m sure I will.